First Lady STUNNED the media, fashion world and everyone else that waited anxiously to see what dress Mrs. Obama would choose. The designers have no clue what gown she will wear until the moment she walks on to the stage. First Lady is wearing a Jason Wu original This is the second time she has chosen this particular designer. Jason Wu will obtain GREAT notoriety in the fashion world for this HONOR! Each of the ladies made Maravilloso fashion statements at the Inauguration Ceremony. Check out what they wore! Sasha chose the Striped Carolyn dress from the Kate Spade collection. 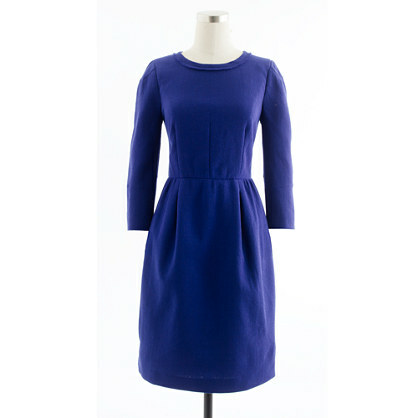 The dress was accompanied by a above-the-knee length purple Kate Spade coat and matching scarf. Malia wore J.Crew: Double-Cloth Lady Day Coat in Fresh Plum from J.Crew and the Teddie Dress in Byzantine Blue. Michelle Obama is wearing a deep blue-and-black custom Thom Browne coat and dress. She completed the outfit with a pair of Reed Krakoff heels.